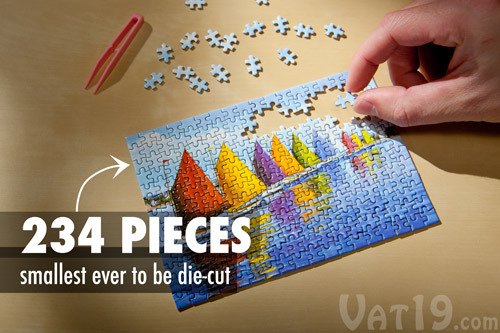 The World's Smallest Jigsaw Puzzle includes 234 of the smallest pieces ever to be die-cut. Amazingly, the completed puzzle is a mere 4" x 6", the same size as a typical photograph! 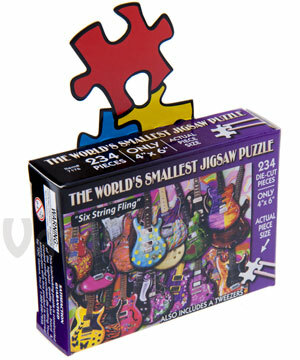 To aid you in manipulating the tiny pieces, the World's Smallest Jigsaw Puzzle includes a pair of plastic tweezers! Currently available in four distinct styles. Estimated time to complete: 45-60 minutes. Dimensions (of completed puzzle): 4" x 6"
It's small, but still solvable! 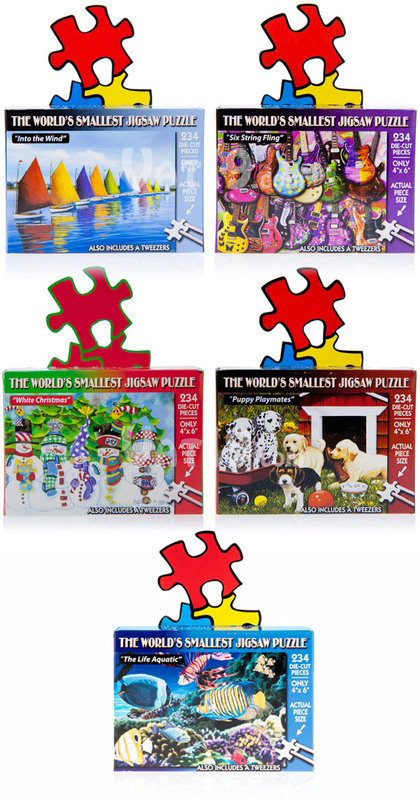 The World's Smallest Jigsaw Puzzle's claim to fame is its diminutive size. However, it's not so small that it's too burdensome to solve. Rather, it's actually quite fun because you'll be able to complete it in an afternoon as opposed to regular puzzles that seem to lay siege to the dining room table for months at a time. 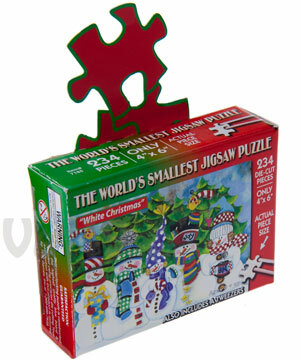 The World's Smallest Jigsaw Puzzle is only 4"x6" when solved. Comes with a pair of tweezers! 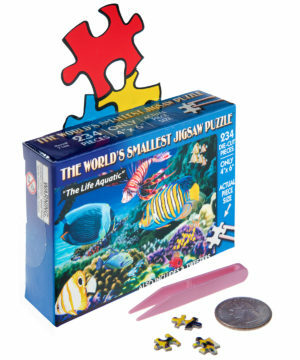 We absolutely love that the World's Smallest Jigsaw Puzzle comes with a pair of tweezers! While definitely not required in order to manipulate the pieces, it can be helpful for those with larger fingers. Each puzzle piece is approximately 1/2" long on each side. 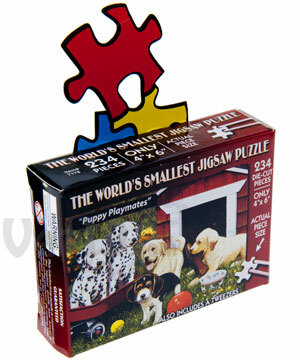 A standard puzzle piece is about four times larger. 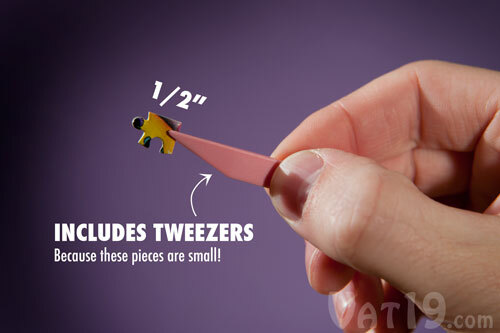 You may find it necessary to use the included tweezers to manipulate the 1/2" puzzle pieces. 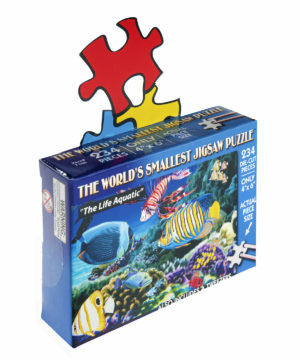 The World's Smallest Jigsaw Puzzle is currently available in many styles: Sailboats, Guitars, White Christmas, Puppies, and The Life Aquatic. 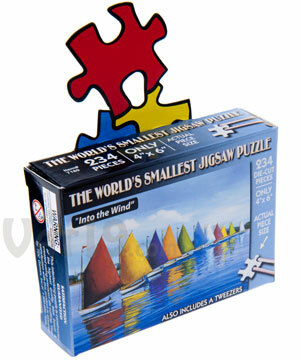 Choose from a variety of puzzle designs.